The former President of Uruguay talking politics in the prologue of the book José "Pepe" Mujica. "La felicità al potere", by Cristina Guarnieri and Massimo Sgroi. The trade union movement, the ideas of socialism, anarchism and communism, and all of the ideas of progress: all have their roots in Europe. It is in your continent that the first great popular movements – the main drivers of social change – emerged. Italy and its workers’ movement, its singular experience of the union of the farmers, its cooperatives, the revolts inspired by Giuseppe Garibaldi, the lucidity of its many liberal intellectuals and, more recently, the heroism of the antifascist struggle and the insurrection of the partisans and the weight and influence of its two great left-wing parties, have all made a significant contribution to this continental picture. The Uruguayan popular movement and its trade unions, the first Uruguayan left-wing political organisers and the first newspapers of social opposition that emerged in the second half of the nineteenth century, were strongly influenced by the ideas and courage of the anarchic and socialist Italian farmers who were often the protagonists of these movements. Many Italians came to Uruguay – which has a tradition of being a refuge for the persecuted – over the years to flee the social struggles and persecutions in our neighbouring countries. Giuseppe Garibaldi himself lived and fought his battles in our lands, leaving traces that still remain today. This is the reason why I can’t help but find it curious that a social militant from a small South American country should attract so much attention, to the point where a book should be dedicated to him by an important publishing house that represents the Italian left-wing tradition of the past and boasts amongst its authors some of the prestigious names of the Italian left-wing of the present. The reason for this is perhaps to be found in the current reality of Latin America, its disruptive economic growth, and the profound social changes that – in many of its countries – brought to government left-wing or socialism-inclined movements. We might also say without a doubt that some social experiments on our continent have had a revolutionary character. As an example of this, suffice it to mention the revolution thanks to which – during the government of Lula da Silva – over fifty million Brazilians began to eat three times a day, gained access to education and managed to leave behind the condition of poverty, going on to form the new middle class. This change was so revolutionary for those who experienced it as is difficult to fathom for those who have always had the certainty of those three meals a day. The fact that for the first time in five hundred years this mixed-race continent had a nation with an indigenous president was a revolutionary change. What is more, this same president proved capable of offering good governance, economic growth and greater social justice to a country famously subject to political instability, injustice, and bad government. Latin America seems also to have found the path to its own integration. A continent which was always educated to look outwards, to Europe and to the United States, for the first time is beginning to look inwards and discover the diversity and wealth of its people in the process of integration. With this I do not intend to claim that the differences between countries have disappeared. But for the first time, Latin American nations are starting to recognise that they need to march united, in their diversity, and accept the fact that integration is not only a historical imperative, but also a way to survive in the globalised world in which the major economic realities fare better than the others. In any case, even if we did give these and many more reasons to explain the attention that is being granted to Latin America today, it is fair to ask ourselves if there may not be something more. Why does the workers’ movement of the European left-wing, which for many years was at the vanguard of political struggle, now look with such attention to the difficult and often contradictory steps that we Latin Americans take in our quest for social progress and for a more dignified life and greater solidarity for our people? Is it just for the wealth that you find over here, or maybe because of the loss of points of reference in your own searches? Why does someone like myself become interesting? I am nothing but an old militant who has committed many errors and suffered many defeats, aside from that which was always my main objective: making a better life for my compatriots. Why does the fact that someone passionately defends politics and demands that governments give their people an example of a lifestyle that is sober and close to that of the majority attract so much attention? Why does it cause such a stir when someone raise the alarm about the growing disrepute that – precisely because of the lack of such an example – politicians and politics are suffering in many countries? Why should it be so surprising that a president alerts the world to the crazy race for unrestrained consumption and against waste, the crisis of global governance, the serious threats to the environment, and the weakness of political institutions in tackling the hunger and misery that still affects millions of human beings all over the world? In truth I think that all of this attracts attention not so much for the merit of the proponent of such themes, but rather because of the absence of other ideas, other proposals and other examples. For many years now, we who look for inspiration for our social and political action, who would like to learn from the experience of those who have already lived through similar tragedies to ours, have not found in Europe what we had always found there in the past. It is saddening to hear the people destined for the highest responsibilities – the representatives of countries with a deep cultural tradition – speak, and witness their total lack of ideas, of forward looking vision, of the ability to fully understand the world in which they live in. Sometimes these people even have a dubious morality. The left, the popular movement, the intellectuals of Europe, have an outstanding debt towards the militants of the rest of the world. In which place other than Europe does there exist such an accumulation of knowledge – at the level of economics, sociological research, politics and social movements? Which other countries could be better laboratories to advance in the generation of other forms of production, other forms of living together that can succeed in overcoming the exploitation of man by man? Which other countries could be better than those in which economic and social development has reached levels as high as those of most European countries? Our Latin American countries have before them decades of struggles to reach levels of quality of life and living together that are even vaguely comparable to the current standards of the countries of Northern Europe, or forms of production that vaguely resemble those that I witnessed in first person in the Basque country or that predominate in the valley of the river Po. We are trying to do our part, we are searching for our path. Sometimes we hit the target, other times we are wide of the mark. But we need your ideas, your commitment, your desire to change the material and ideal life conditions of this humanity. You cannot shun this responsibility, you must take on the challenge: think, fight, try, and even make mistakes, but always with your sights set on improving the lives of your people, on overcoming this system and this model of society – which must be changed before it leads us all to catastrophe. José Alberto “Pepe” Mujica Cordano is a Uruguayan politician who was President of Uruguay between 2010 and 2015. A former urban guerrilla fighter with the Tupamaros, he was imprisoned for 13 years during the military dictatorship in the 1970s and 1980s. 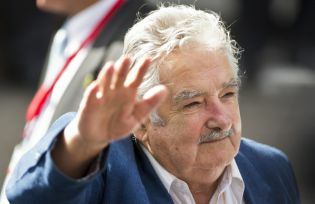 A member of the Broad Front coalition of left-wing parties, Mujica was Minister of Livestock, Agriculture, and Fisheries from 2005 to 2008 and a Senator afterwards. As the candidate of the Broad Front, he won the 2009 presidential election and took office as President on 1 March 2010. He has been described as “the world’s ‘humblest’ president”, due to his austere lifestyle and his donation of around 90 percent of his $12,000 monthly salary to charities that benefit poor people and small entrepreneurs. He received many awards for his effort in fighting drug-related crimes, health issues and poverty.